Thanks to the Founders and defenders of our great nation, we are afforded our free speech rights. With those rights comes responsibility. At the Creston Classic Rodeo on Sept. 15, I irresponsibly told a joke that many people found offensive and I apologize. This was a joke I read in 2010 and chose to recycle it during this election season. I simply substituted Ann Romney’s name where the original joke used Sarah Palin’s name. While no apology will satisfy everyone, I hope those of you in the Creston area with whom I have had a 15 plus year relationship will accept mine. I wish all of you much future success with the Creston Classic Rodeo. 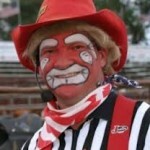 Mike Hayhurst was the rodeo clown at the Creston rodeo in September. People need to lighten up already! This guy didn’t tell a joke to hurt anyone, he did it for a laugh – and he got one out of me and a lot of the people I know. I don’t really care what race, gender, religion, sexual orientation, or social class you belong to… I’m going to laugh about it. I don’t think there’s anything wrong with it as long as you’re an equal opportunity offender. Anyone who interprets this joke as hate speech needs to seriously re-evaluate how much they allow the words of a rodeo clown to affect their own life. Oy, rOy. I feel sorry for your son. Since you clearly don’t understand why the clown’s joke is racist, I suggest that you tell the joke to the biggest African-American man you can find, then ask him to explain why it is racist. When you regain consciousness, perhaps your consciousness will be raised regarding racism. If not, please keep trying–for your son’s sake. You have, indeed, been well-conditioned. Exactly the response I expect of many people. Oh man… *finally* some racism for the left to trip all over themselves to be the loudest to cry “RACIST!” I joked with my son, reading this story when it broke, and said, “You watch, it’ll be front page/top fold of the Trib for days!” (it was there for three days, fewer than I thought, but still 3 days as a front page issue). Seriously, it seems like too many people around here dream of this day: the day they can cry “racist” about someone. Ironically, racism is still around because many of these same people don’t want to let it go; they want to see it everywhere and they are looking hard to find it! It consumes them. It would be a funny joke if Chris Rock or some other black comedian made it. Hell, most people would be laughing at it and move on. Yeah, it’s a double-standard, and yeah, it doesn’t play well out here in the left coast and (worse yet) it’s told by a white guy. So how was this racist? Oh, it’s comparing the First Lady to a dark-skinned native somewhere in Africa, South America or S.E. Asia? How is that racist unless you WANT it to be? One would think that SEXIST is where the joke truly hits, not racism. Are you saying there is something “wrong” or “racially degrading” about being featured in National Geographic? Remember the lefty rule of comedy (for whites only): your ONLY viable target is conservative, white, Christian males. Got it? Conservative. White. Christian. Males. Good, let’s insult THOSE people instead, mmkay? Do that and you’ll have lots of lib street cred. This should have been about the sexist aspect of it, not the made-up racist one. But racism trumps sexism in the twisted world of these people. I saw this joke as objectifying women, not being racist… until all the people screaming racism assured me that it was, in fact, racist. Guess I just don’t think like that. I’ll try to work harder to have racism come to mind more often, then?